Abu Dhabi, July 10, 2018: A team of scientists has captured on video a four-mile iceberg breaking away from a glacier in eastern Greenland, an event that points to one of the forces behind global sea-level rise. 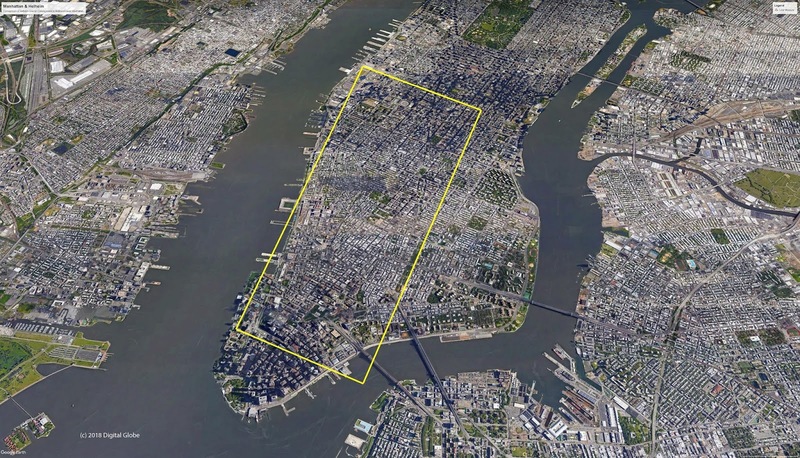 The resulting iceberg, broken off from Greenland’s Helheim Glacier, would stretch from lower Manhattan up to Midtown in New York City. An illustrated overlay of the iceberg’s dimensions is available here (Credit: Google Earth, Courtesy of Denise Holland): https://bit.ly/2u4pzVR . The video, which shows sea level rising as the ice from the glacier enters the ocean, may be viewed here: http://bit.ly/2tWk5fO. This phenomenon, also known as calving (the breaking off of large blocks of ice from a glacier), may also be instructive to scientists and policy makers. The calving event captured on video began on June 22 at 11:30 p.m. local time and took place over approximately 30 minutes (the video has condensed the time of this occurrence to approximately 90 seconds). The video depicts a tabular, or wide and flat, iceberg calve off and move away from the glacier. As it does so, thin and tall icebergs—also known as pinnacle bergs—calve off and flip over. The camera angle then shifts to show movement further down the fjord, where one tabular iceberg crashes into a second, causing the first to split into two and flip over. A 2017 estimate suggested that a collapse of the entire the Western Antarctic Ice Sheet would result in a 10-foot-rise in sea level—enough to overwhelm coastal areas around the globe, including New York City. So far, the Thwaites Glacier, a part of the Western Antarctic Ice Sheet that has already drained a mass of water that is roughly the size of Great Britain or the state of Florida, has accounted for approximately 4 percent of global sea-level rise —an amount that has doubled since the mid-1990s. The research team is currently studying the forces behind sea-level rise—a development that has concerned scientists in recent decades because it points to the possibility of global disruptions due to climate change—under a grant from the National Science Foundation. The research is centered on the Thwaites Glacier. The research is being carried by NYU’s Environmental Fluid Dynamics Laboratory and NYU Abu Dhabi’s Center for Global Sea Level Change—both directed by David Holland.